Why should you use a “Rated” advisor to help you with your “asset protection” plan? 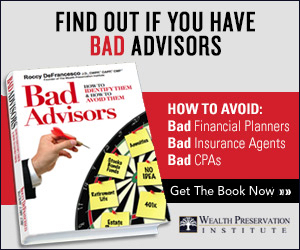 Simply put, if you want to use an advisor who knows not only their typical field of study, but is also proficient in the proper techniques of asset protection planning, then you should only use an advisor who has been rated by the APS™. There are so many different kinds of advisors pitching/helping clients with the topic of “asset protection” and because of this, the advice given can be dramatically different (and many times wrong). If you look for help from one advisory group (such as practicing attorneys), the advice will likely be dramatically different than another group (such as financial planners). It’s almost a comedy these days. Have you ever heard someone on the radio touting asset protection techniques? The vast majority of advisors “pitching” asset protection know very little if anything about the topic. They are good marketers in that they know how to scare the public and then they typically overcharge for simple Nevada LLCs. Because the public is not schooled in the proper asset protection techniques, they have to rely on others. If someone says he/she knows asset protection, how is the public supposed to know any different? Now with the APS™, you can educate yourself and protect yourself from the terrible advice being given by many advisors who tout themselves as knowledgeable on asset protection. Further, you now have a place you can go to find a competent advisor in your local area who can help. Let’s look at some examples which will illustrate why the APS™ is so needed to educate and protect the public. The following is a list of advisors who The APS™ sees typically touting themselves as advisors who help clients with asset protection. Unfortunately, the reality is that they know very little about the subject matter. If you want to test the knowledge of your current advisors, we suggest you give them a test. Click here and you will go to a screen with a test you can print and hand to your current advisors. The results of testing your advisors on their knowledge of asset protection will shock you. Non-Advisors—While this might surprise you, there are many non-advisors giving advice on asset protection and touting themselves as “gurus.” Why? Because they are making money referring clients to firms that create NV, DE, etc. LLCs for clients. This is the worst type of advisor to take advice from (unless they have had formal training in the area of asset protection). To learn why, click here. Financial Planners (FPs) and Insurance Advisors—Why do FPs and life insurance agents sometimes tout the fact that they know “asset protection?” There are two main reasons: 1) cash value life insurance and annuities in a handful of states are asset protected from creditors (in part of fully), and 2) asset protection mills (firms that crank out NV, DE, etc, LLCs for asset protection) kick back referral fees to advisors for referrals. To learn the problems of working with an FP or insurance advisor who has had NO formal training in the area of asset protection, click here; and to learn the problems of working with an insurance advisor who has been trained by one of the asset protection mills, click here. CPAs/EAs/Accountants—Oftentimes, this class of advisor has been hooked into the asset protection game because they are looking for the referral fees described in 2) above and because they can use the topic as a client gathering tool to pick up accounting business. To learn the problems of working with CPAs/EAs/Accountants who have had NO formal training in the area of asset protection, please click here. Attorneys—First, you should know that asset protection planning is not taught in law school. Second, you should know that less than 1% of all attorneys in the country have any significant knowledge about asset protection planning. Of those that do, most only know domestic asset protection planning (maybe the correct way and maybe not). Obviously attorneys provide asset protection advice because they legally can, because it can help their clients and because it is a nice income source. Having said that, please click here to learn more about why most attorneys do not fully understand asset protection planning.